KRYSIA OSOSTOWICZ, violin. Krysia studied at the Yehudi Menuhin School, at Cambridge University, and in Salzburg. She has performed over twenty concertos with orchestra, ranging from Bach to Britten and her many recordings have won a number of awards. She has taught at the Guildhall School since 1987. 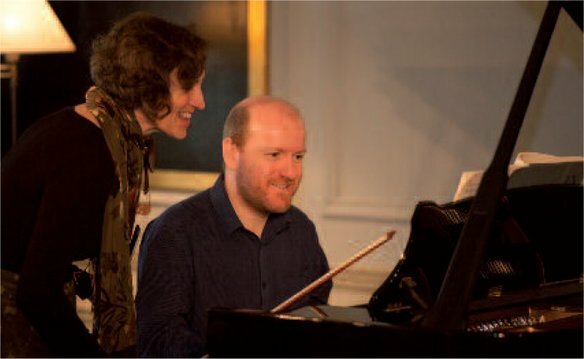 DANIEL TONG, piano. This is a welcome return for Daniel to Radlett. His musical life is spent performing as soloist and chamber musician as well as directing two chamber music festivals and occasionally writing. He also has a busy teaching career. For 2015 and beyond he is teaming up with violinist Krysia Osostowicz for a series called ‘Beethoven Plus!’.